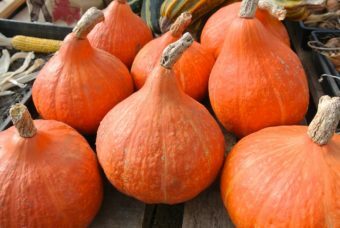 Another great butternut-type squash that matures in our climate! Canada Crookneck is a bottle shaped “neck squash” that the present-day butternut type was selected from. Very productive and holds well in storage when properly cured. Average size is 3 1⁄2 lbs, though a few reach 6 lbs. Not all necks are curved. Unique shape takes a bit of getting used to but after testing it in the kitchen, we’ve come to prefer it. The bulbous end is easily cut into two perfectly sized bowls that are a fun and delicious way to serve stuffed squash. Size and shape of the neck make it easy to peel (skin does soften enough when cooked to skip this step), quarter lengthwise, and slice into bite-sized chunks. Reported to resist squash vine borers. 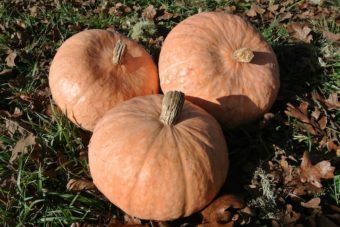 First offered commercially in 1834 though it’s said to have originated with the Iroquois Nations. 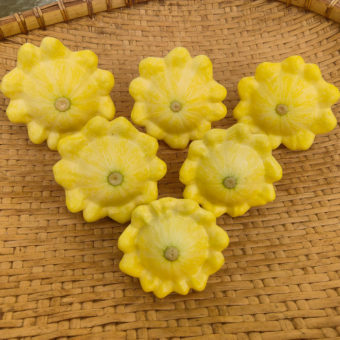 Canada Crookneck is included in the Slow Food Ark of Taste. 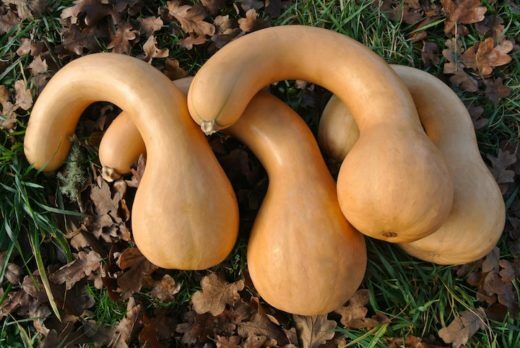 I can’t speak too highly of this squash. In my cold short season (99 day) location in central Alberta, squashes don’t always ripen well though started from transplants. I have picked this in mid September with the skin still greenish, cured it at room temperature while it slowly ripened to tan, and it still tastes great and keeps well. And it’s fun and easy to process!